I’m really proud and honored we can have you here on my magazine! How are you? 1. First I would like to ask you about some of the earliest influences you had? BILL: Paul Butterfield band, John Hammond, Chuck Berry, Howling Wolf, Sonny Terry, Sonny Boy Williamson (Rice Miller)..and Jimmy Reed and of course the Rolling Stones whose first album I believe rates as one of the finest Blues/Rock albums ever. MICK: Lonnie Donegan! Then the early British bands such as Animals, Yardbirds, Stones… they were all R&B based, getting their influences from Jimmy Reed and Chuck & Bo, so it was my first opportunity to hear the blues. Then the great British blues guitarists Clapton, Beck and Green, and through them the great American players BB, Freddie, Albert, Buddy Guy and Otis Rush. My favourite band is ZZ Top!!! 2. What was your first band? Did you release anything in that time? 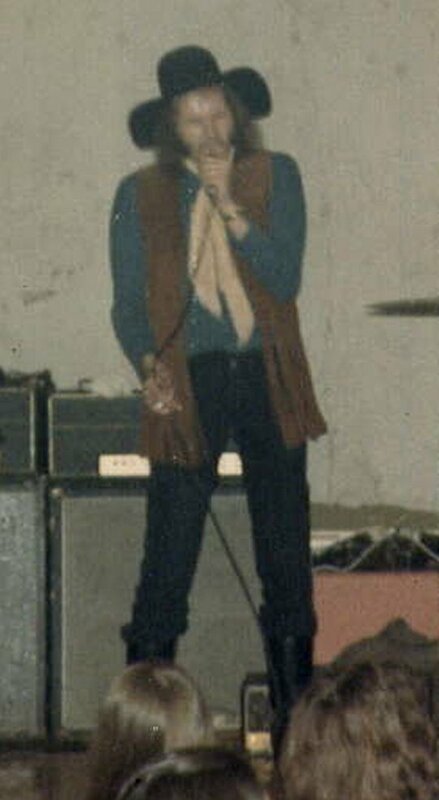 MICK: My first professional gigs were with the Cliff Charles Blues Band in London.. No – no recordings, but we did three gigs.. one with Peter Green’s Fleetwood Mac and two with Graham Bond. Fantastic!! Bond sat there at his Hammond in his kaftan with a dolly bird next to him, and cranked the volume up until the Leslie cabinet was creaking and groaning.. unbelievable sound. Peter Green was very friendly and helpful. BILL: Monas..No releases..morphed into Thin Red Line and later Butterfly which worked extensively in Europe and became quite popular in Germany. 3. Where were other members from Killing Floor before joining the band and how did you come together and decide to start a band? MICK: I met Bill when we both joined a new South London blues band. The band did one gig at a party and we were terrible. But I liked Bill’s voice – I thought he sounded a bit like Long John Baldry at the time, and we got on well, so decided to form a band. Bill came up with the name KILLING FLOOR from the Howlin’ Wolf record. We advertised for a bass player and found Mac, sleeping in his van outside Clapham South tube station in London, having moved down from Wales to find a band. 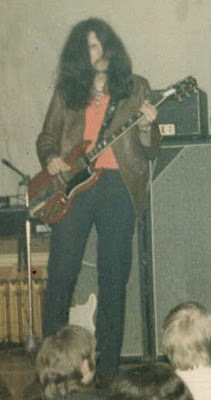 Bill had already met Bazz when they were both working in Germany in seperate bands. 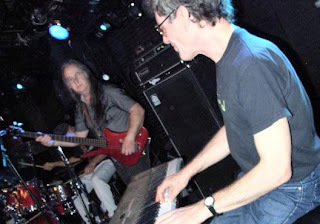 We rehearsed as a four piece for some time, but eventually decided to add keyboards. We were fortunate to find Lou Martin, a young and unusually talented pianist who played like a cross between Memphis Slim and Jerry Lee Lewis. 4. How do you remember some of the early sessions you had with Killing Floor? MICK: We rehearsed for a long time, sometimes at my family home in Circle Gardens, South London, driving the neighbours mad. BILL: Circle gardens rehearsals and an elderly neighbour of Mick’s saying I sounded like Tom Jones!!!!!!!!!!!! !Playing our first gig at London’s Middle Earth with Captain Beefheart and some of the audience thought we were off duty Policemen…. 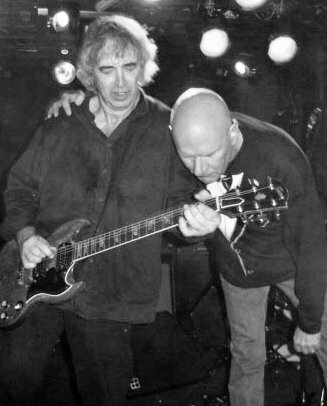 MICK: The “policemen” business was because Bazz’s brother had got the gig for us – he was a policeman! The club thought it was hilarious and billed us as “policeman’s special”. It was a great night.. a big room full of the smell of joss sticks and oil slides. MICK: To keep working, we played all kinds of gigs. Some of them not really suitable for a blues band, like youth clubs and discos. 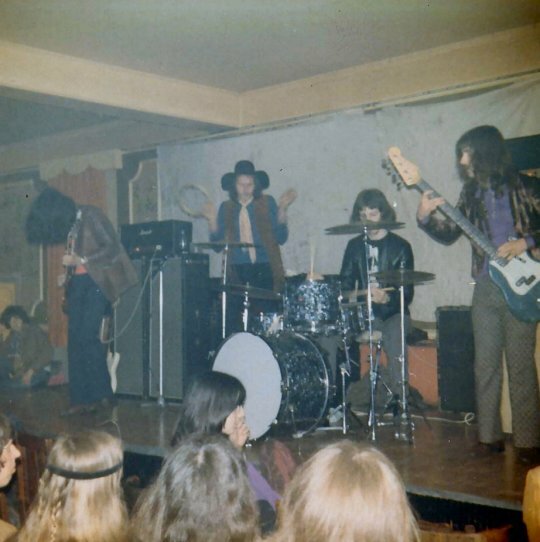 But there were a few really good clubs such as the Blues Loft in High Wycombe, Buckinghamshire, where we were very popular. One night the footstomping from the crowd brought the ceiling down in the room below! 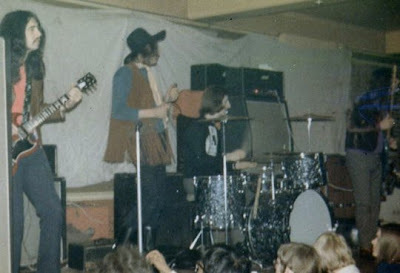 I also remember a night when Paul Kossoff and Simon Kirk from Free jammed with us at a club in London. “Koss” got up and played through my amp, first turning all the controls up full, and then playing with all the passion he was famous for. It was one of the only times I can remember that I was “blown off stage” by another guitarist, but I didn’t mind and learned a lot. Original itinerary for the first tour with FREDDIE KING, showing rehearsal at the Pied Bull, Islington, 29 May 1969, and dates at the California Ballroom, Dunstable, Free Trade Hall, Manchester (with Howlin’ Wolf) and others. 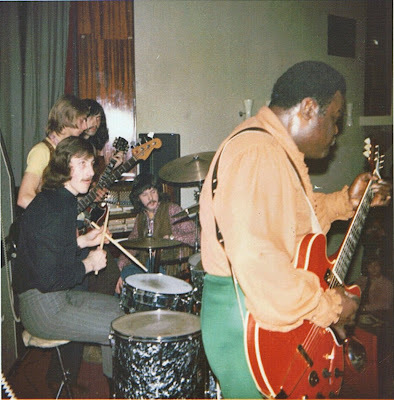 Freddie King with Killing Floor at the L.S.E. London,1969. 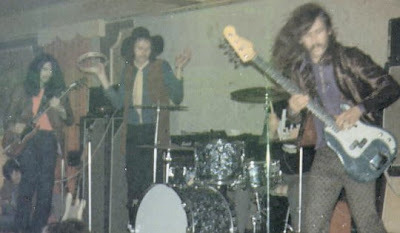 Behind Freddie .. Bazz Smith, drums, Paul Taylor (bass player at the time), Mick Clarke, Lou Martin. 5. 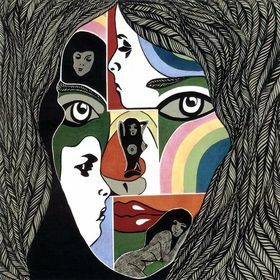 In 1969 you released your first LP and I would like if you could share some of your memories from producing and recording this great LP. I would also like to ask you what can you tell me about the cover artwork? 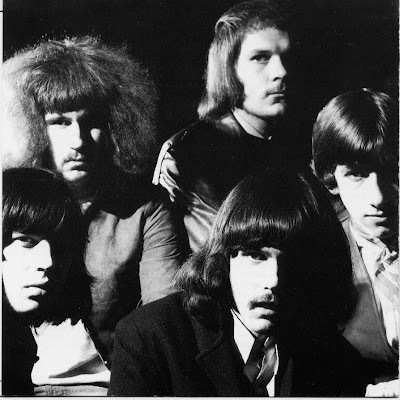 MICK: We were very young and inexperienced so we learned about making an album as we did it. The album has lots of mistakes on it but also has a raw energy that comes only from youth and enthusiasm. We actually recorded far too much music and had to cut some of the songs in half – I’m still trying to track down the master tapes but I’m afraid they are long lost. The British album cover was a straight portrait photo, taken, as I remember, by David Wedgewood at Decca. When the album was released in the USA on Sire they came up with an image of a jailhouse, which I think we all preferred. 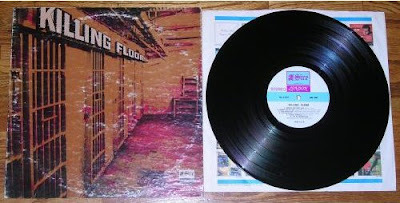 Killing Floor’s first ever record.. a demo recorded at R.G.Jones’ studio in Morden, South London, in 1968, featuring versions of “Good Morning Little Schoolgirl” and Willie Dixon’s “Same Thing”. The record was never released commercially, but helped to launch Killing Floor’s gigging and recording career. 6. Out of Uranus, your second album came a year later. Wow! this album is so good. What do you remember from it? MICK: Glad you like it. At the time it wasn’t particularly well received, because I think it didn’t fit into any categories. 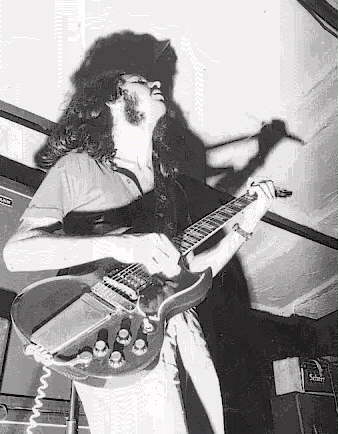 The blues boom was over in England so bands were going heavy or progressive. “Uranus” doesn’t really sound like any other album.. it was the product of four young inventive minds just doing their own thing. I think it probably has more fans now thanks to many re-issues and youtube videos. BILL: Too stoned to remember anything at the time other than writing Fido Castrol as a tribute to Fidel who at the time I greatly respected. Again, this has now become a cult item and like the first album sells for large amounts of money on eBay. 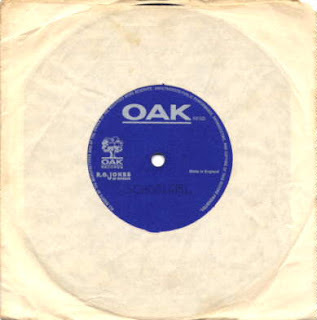 At the time of release back in 1971, it did not fit neatly into any genre, but has since been described as ‘Punk Blues’,’ Psycho Blues’ by modern day music aficionados. MICK: I remember we were always tired. we recorded at night after driving back from gigs and were usually worn out before we even started recording…it’s a good job we were young enough to handle it. One night the producer sent us out for a walk around Hyde Park to wake us up! I think the album came out pretty well considering that. Who did a very interesting cover artwork for it? MICK: It was already designed for another project and was given to us by the record company. So it doesn’t really fit the name or the music, but it is certainly distinctive and memorable. Someone told me recently that they had bought a copy on which the artwork had been “censored”. 7. What can you tell me about touring? Where all did you play and if you perhaps have some interesting stories to share from concerts that would be really great! MICK: Some of the best times were touring with the Texas blues guitarist Freddie King… all the gigs were great and I learned a lot about blues guitar and professionalism. BILL: I was at times given the task of escorting Freddie King and later Howling Wolf to gigs and I remember feeling in awe of these great men who were very humble in many ways. 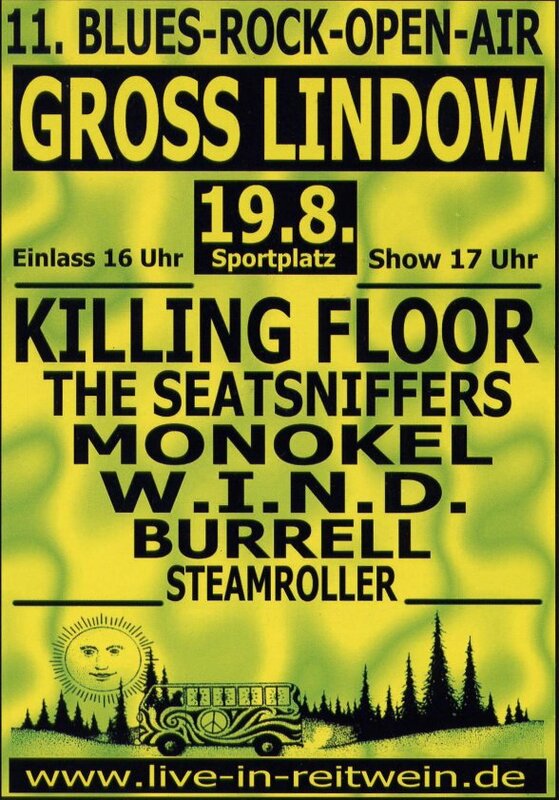 Gigs with KF were very high energy events and I remember coming off stage at most gigs soaked in sweat and being exhausted and totally drained. 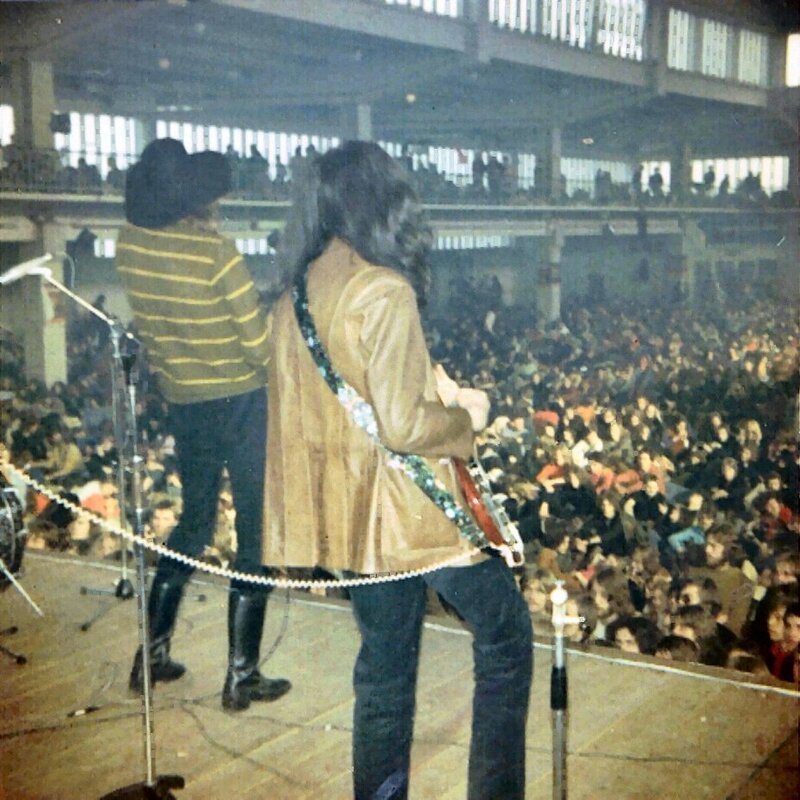 MICK: Later we toured a lot in mainland Europe. The European trips could be bizarre. 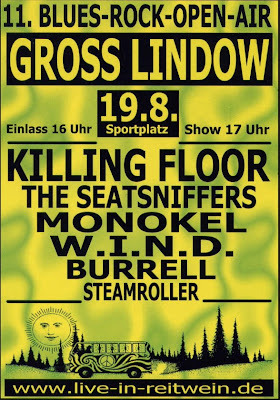 In those days there was not a real club circuit in Germany or Switzerland and the roads were not great either, so we had some strange adventures, such as being stranded in Berlin after having to try to impersonate another band, and having to be rescued by the British Consulate. 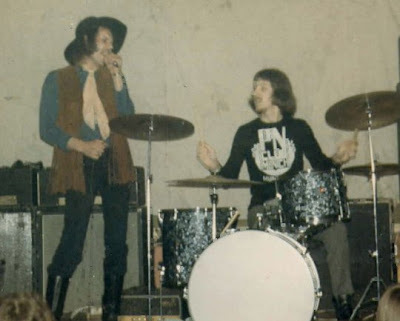 But one really good experience was the Hamburg Easter Festival in 1970, when we played with several other British acts.. Alexis Korner, Groundhogs, the Nice to about 10,000 people. It must have been one of the very first European rock festivals. 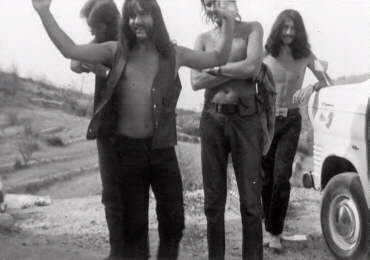 We travelled home on the ferry with Black Sabbath which was an enjoyable and interesting trip. Killing Floor at the Hamburg Easter Rock Festival, Ernst Merck Halle. 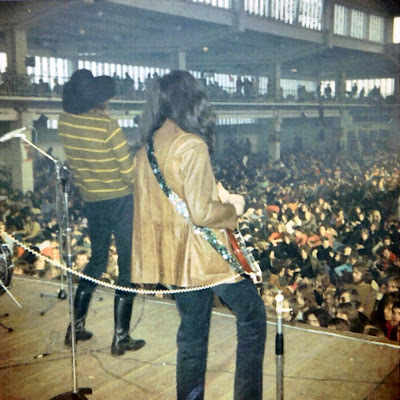 Mick and Bill rock Germany, 1970. Killing Floor at Dagenham Roundhouse, London, 1971. Mick at L’Enclume, Bandol, South of France, 1970. When we were young.. KF in Bandol, 1970. L-R Bazz, Mac, Bill, Mick. Photos by courtesy of our friend Ian from the band Gully Foyle. MICK: After some changes Killing Floor finally ran out of steam completely in 1972. 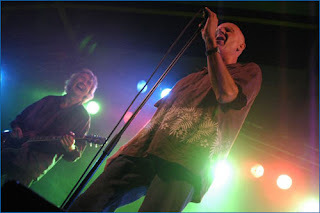 I continued working with various bands such as Cliff Bennett’s Toefat and Daddy Longlegs.. I was always in the back of a van on a motorway somewhere. Bill dropped out of professional music and had a successful career in London. Mac worked with Paul Rodgers in his band Peace as well as other projects – Bazz worked with a variety of bands in Europe and America, eventually moving to Switzerland. 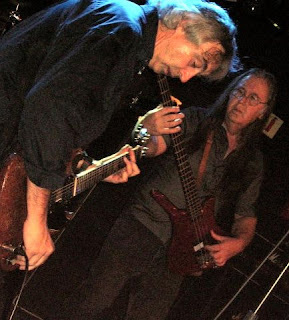 Lou Martin joined the Rory Gallagher Band and is featured on some of the classic albums such as “Irish Tour” and the newly released “Notes from San Francisco”. 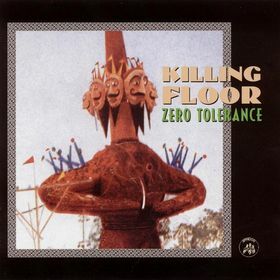 Killing Floor got back together again in 2003 after a thirty year break and recorded the third album “Zero Tolerance” for Appaloosa Records in Italy. 9. for Mick: I know you started a band called SALT…. In late 70’s you started your solo carrier and released many great albums. What are you doing these days? MICK: was a great band. We played high energy blues rock and we were very successful on the club scene in the UK – there wasn’t really anything else around like us. We also appeared at the Reading Festival in 1977 which was a very big deal, but soon after Punk came along and bands like us were regarded as old fashioned. 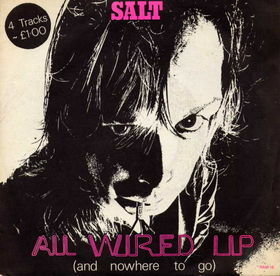 Killing Floor’s bass player Mac (Stuart McDonald) was also in SALT, so it was a seriously good band. 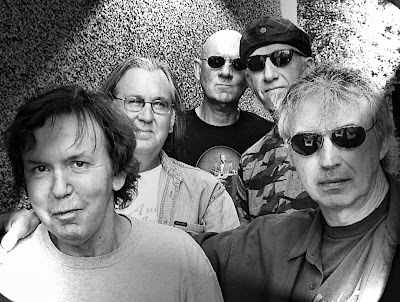 In the early 80s I started the Mick Clarke Band with a solo album “Looking For Trouble” and it became quite successful. We toured extensively in Europe and America and put out lots more albums which are all still available. These days I’ve slowed down a bit but am still writing and recording. I released a new album this year “The Rambunctious Blues Experiment” which was recorded in my home studio, and I have a few European shows coming up, plus a new tour with SALT. In between we’re working on the new album for Killing Floor! MICK: More of the same. I enjoy writing and recording so will press on with more projects. I’m always happy to go out and play concerts when I’m asked to, either with the MC Band, SALT or Killing Floor. 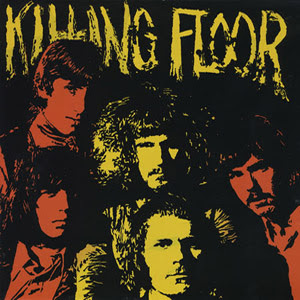 As I said, we are now working on a new Killing Floor album, which will be only the band’s fourth album in the space of 43 years! It is the four piece line-up, like “Uranus”, and is all new original material. I hope it will be out early next year and maybe KF will be out playing a few more shows to promote it. 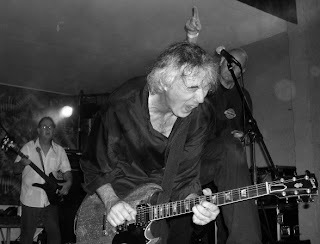 BILL: New Killing Floor Album will be available by early 2012…It will Rock your Blues!! 11. I would like to thank you for taking your time and effort to discuss about your music carrier. Would you like to add something else? MICK: Thanks for your interest in Killing Floor – keep rockin!